A private tour of The Museum of Russian Art's multimedia presentation of one of the most tragic events of WWII: the 900-day siege of Leningrad in 1941-1944. Limit 20. Pay admission at the door, free to museum members. As part of Hitler's Operation Barbarossa, German forces laid siege to Leningrad (now St. Petersburg), resulting in an estimated one million deaths among its residents. The exhibition will focus on the city’s struggle and survival through photographs, films, maps, and stories of the war period. It will highlight both the gruesome side of the war and the life-affirming effort of the people who lived through the horrible ordeal. This tour is offered to alumni of Harvard and other Twin Cities Alumni Network organizations, and their guests. The tour itself is free; pay museum admission at the door. Click here for details on visiting the museum. 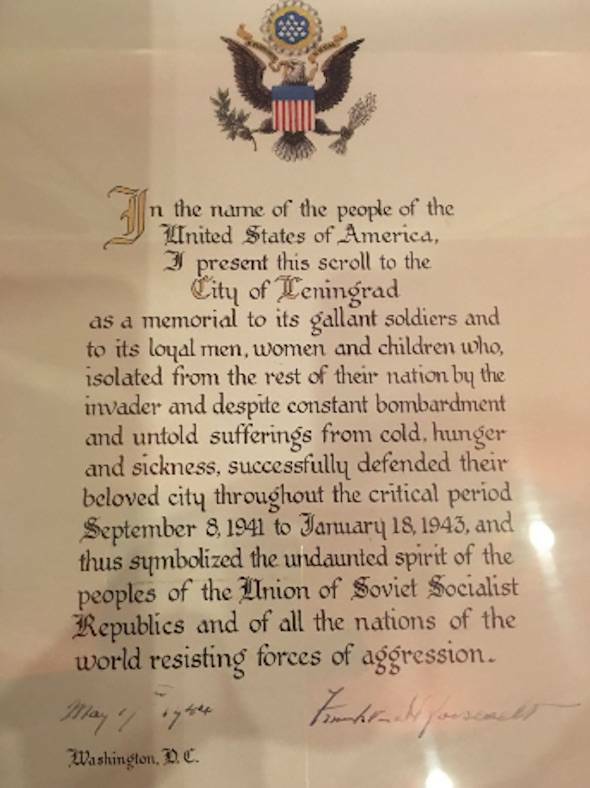 The following proclamation by President Franklin D. Roosevelt, from the collection of the Museum of the History of Leningrad, is on view at the exhibition.